Documented declines in pollinators have been recorded worldwide in recent decades, with the majority of attention being focused on honey bees and bumble bees. Much less is known about wild bees. There are 465 documented bee species in Michigan, but little is known about their populations trends due to limited long-term monitoring. The goal of this project was to document the current native bee community of Michigan and to use historic records to determine the degree of change in abundance and diversity within these populations. We sampled across a broad geographic area with varying land uses and land managements. Sites included agricultural land, unmanaged natural areas, and areas specifically managed for pollinators. This research provides a baseline for future assessments of bee population health, and can be used in evaluating the success of land management programs. Dr. Graham is a Postdoctoral Research Associate in the Entomology Department at Michigan State University. She is the project manager for a $1 million USDA-NIFA funded grant on pollinator health in Michigan. 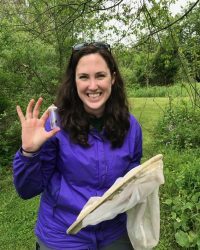 She specializes in wild bees, with a particular interest in assessing the effects of environmental challenges on bee health and pollination services.